At the height of his career as a jockey, which included more than 1,000 wins during stops and starts between 1981 and 1998, Jose Corrales never earned more purses in a single season than the $972,180 his mounts banked in 1988. With Something Awesome, the horse he helped turn from a former claimer into a multiple graded-stakes winning millionaire, Corrales has the unique opportunity to earn more than four times that amount – in a single race. Stronach Stables’ homebred Something Awesome is set to make his 8-year-old debut in the $9 million Pegasus World Cup Invitational (G1) Jan. 26 at Gulfstream Park. It is a fitting stage for both horse and trainer, whose success has been intertwined since they were first united in the fall of 2017 at Laurel Park. Corrales, 58, knew he wanted to become a jockey at the age of 7, learning the trade in his native Panama, a country that has exported the likes of Hall of Famers Laffit Pincay Jr., Manny Ycaza, Braulio Baeza, Jorge Velasquez, Jacinto Vasquez, Javier Castellano and Alex Solis and Gulfstream’s record-setting two-time Championship Meet leading rider, Luis Saez. Riding primarily at tracks in the state of Washington during the mid-1980s, Corrales became friends with Wesley Ward, the Eclipse Award-winning apprentice jockey of 1984. Ward turned to training in 1991 and hired Corrales as his assistant, but when Ward relocated to California, Corrales went to train in Macau. Soon Corrales returned to the United States and by 2011 finally got his big break. Owner-trainer Burton Sipp introduced him to Andy Stronach, a breeder and owner and the son of Pegasus founder Frank Stronach, and the two began a solid working relationship. One of them was Bodhisattva, a horse Andy Stronach bred and gave to Corrales as a gift. 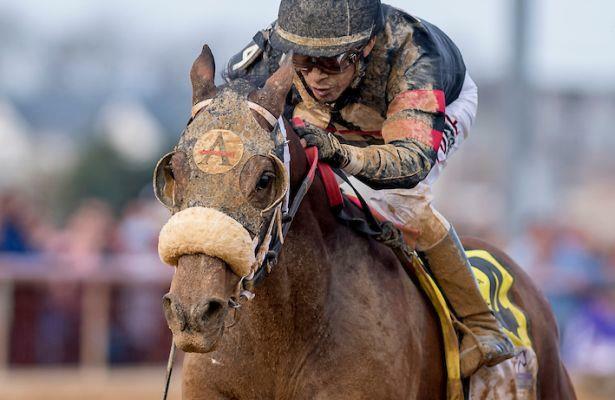 The horse whose hard-to-pronounce name means “enlightened being” won three stakes for the owner-trainer and was among seven opponents defeated by eventual Triple Crown winner American Pharoah in the 2015 Preakness Stakes (G1) at legendary Pimlico Race Course. Enter Something Awesome. A gelded son of Awesome Again – a Frank Stronach homebred that won nine of 12 career starts, including the 1998 Breeders’ Cup Classic (G1), and purses of more than $4.3 million – Something Awesome is out of the Dance Floor mare Somethinaboutlaura, both multiple graded-stakes winners. Something Awesome began his career in southern California with trainer John Shirreffs before the Ontario-bred was sent to Danny Vella at Woodbine in the spring of 2016. Overall, he won four of his first 18 races and ran for a tag four times between April and October of 2016, for as little as $32,000. Corrales got Something Awesome at his Laurel barn after the horse finished seventh in a seven-furlong optional claimer over Woodbine’s synthetic surface in August 2017 – the 14th time in 18 races the horse had run at distances of a mile or less. Something Awesome debuted for Corrales Nov. 5, 2017, coming from last to win a six-furlong second-level optional claiming allowance by four lengths in 1:10 flat with Hall of Famer Edgar Prado aboard. Prado is named to ride for the sixth time and fifth in a row in the Pegasus. Corrales kept Something Awesome sprinting, where he reeled off another optional claiming allowance win and was third in the Fire Plug Stakes, both at six furlongs, before his gutsy neck triumph over late-running Fellowship in the seven-furlong General George (G3). It was the first graded-stakes victory for both trainer and horse, now ridden by Elvis Trujillo. From there, Corrales stretched Something Awesome out to 1 1/8 miles in the Harrison E. Johnson Memorial Stakes, where he cruised by 2 ¼ lengths, and then the Charles Town Classic (G2), taking a short lead into the stretch and staying resolute to the wire in a neck triumph that marked the first for the trainer in a race with a seven-figure purse. Something Awesome has raced just twice since then, getting a break after finishing eighth in the Pimlico Special (G3) last May. He returned to be second behind subsequent stakes winner Colonel Sharp in an open seven-furlong allowance Nov. 16 at Laurel, and has been preparing for Pegasus at Gulfstream since Christmas. “The Pimlico Special came and I think he ran too much and he was a little tired then. The horse came back and bled a little bit. We gave him a couple months and brought him back,” Corrales said. “It was a little difficult to get him back. I couldn’t get him right. With a few prayers and everybody’s help, the horse got good. I had him ready for the race. We hooked a little horse and got a lot of competition. The time was fast and he ran a very good race. Since then, he just got better. In the 1 1/8-mile Pegasus, Something Awesome will be part of a field that includes 2018 Horse of the Year finalist and likely race favorite Accelerate and fellow Grade 1 winners Audible, City of Light, Patternrecognition and Seeking the Soul; Preakness and Clark Handicap (G1) runner-up Bravazo, and Mexican Triple Crown winner Kukulkan, undefeated in 14 starts. “Like everything else, it is a race and you want to win as many as you can. But, it’s a race that if you win it would help your whole life. It would be nice for me and my family and everybody just to win this kind of race,” Corrales said. “It would mean a lot, but I would be the same person.